The widow’s mite | Walk with us! Receiving rice for the student community. Last night I was hard pressed to decide what to write on my last day in Manila and my last day in Asia as tomorrow morning at 05:30 I will leave for the airport and the long trek home. Then this morning I was talking at breakfast to Br Dang van Nuyen, an SCJ from Vietnam, who asked me if I had photos of the Rice Lady from St. Paul’s from Ho Chi Minh City. He told me about her and what she does for our community and I think her story is worth telling. It’s worth telling first of all since the US SCJ Province financially supports Vietnam, India and our Philippine SCJs to one degree or another. It’s especially true for Vietnam and India since they both were founded some years after we began here in the Philippines and neither society has a majority Catholic population as you find here. That financial support comes from thousands of donors, in may ways just like The Rice Lady, who give what they can when they can to support our works and the SCJs. Any SCJ worth his salt thanks God daily and prays daily for our benefactors who truly do make all that the US Province does possible. Part of “what is possible” is the support we give to our mission efforts in countries like India and Vietnam as well as in Africa and Latin America. I met the Rice Lady on my first day in Vietnam when we went to visit St. Paul’s parish and Huong Tam School that the US Province supports. At the end of the visit we met our Rice Lady and two helpers who had a couple of sacks of rice for us to take back for the community. The rice is the widow’s mite of the story. You see this woman is not wealthy and really cannot afford to pay for two sacks of rice each month to help feed 22 hungry young men trying to master English as they begin their studies in hopes of becoming SCJs. But this woman has figured out a way to solve that problem and provide the much needed rice. Each month she collects money from friends, neighbors and Lord knows who else, to gather enough funds to pay for four sacks of rice. Each month, somewhere in the city once known as Saigon, and now called Ho Chi Minh City, she meets up with SCJs, like Br. Bat (my Mi Kong Delta companion) to get the rice headed to the SCJ kitchen and into the bellies of hungry, active and grateful young men. When you realize that rice is served seven days a week, and at least two meals a day, it takes lots of pounds of rice to last a month. Our rice lady does her part to make it all possible. Now if you were to ask me: Why do you go on trips like this and what to you get out of it? I really think this story of the Rice Lady (the widow’s mite) says it all. It’s such a humbling experience to meet people like her who give so much and who love the SCJ community and the Gospel values of caring for others it represents. 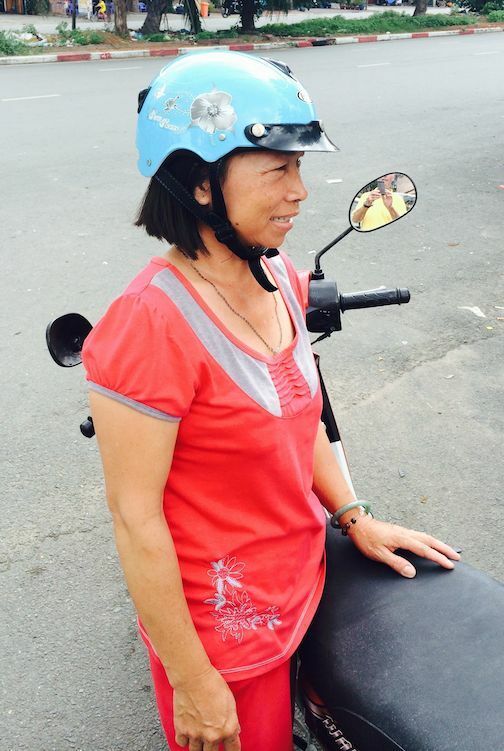 Without my connection to SCJs in Vietnam or the Philippines or India it would never be possible to meet up with a woman like this. I am ever so thankful for the window to the world being an SCJ has given me. 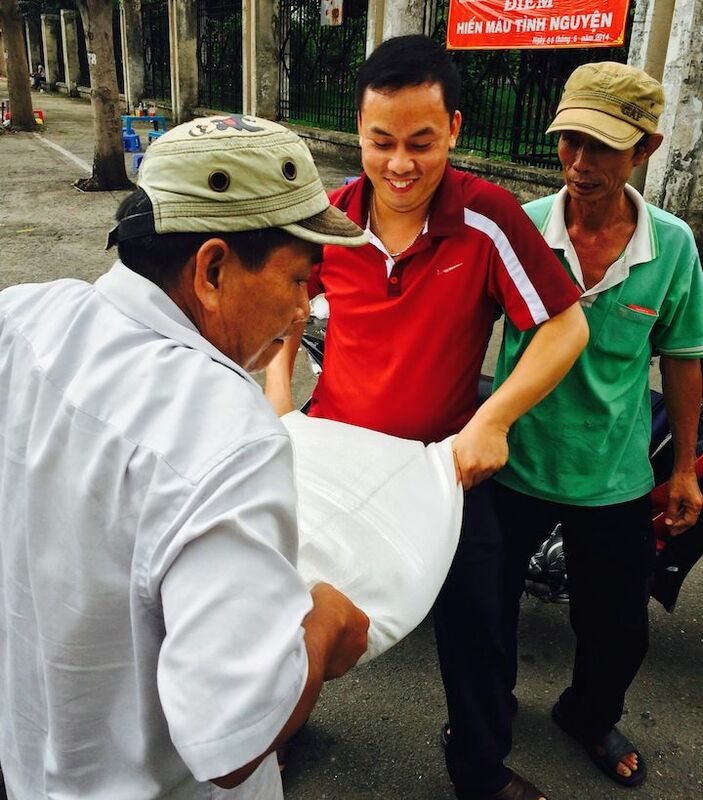 Likewise I really am humbled by the story of the Rice Lady of Ho Chi Minh City and what she gives to us.